The PMC would not be possible without the 4,000 volunteers who support the event during PMC weekend and throughout the entire year. By volunteering for the PMC, you transform your energy, compassion and encouragement into furthering cancer research at Dana-Farber Cancer Institute. 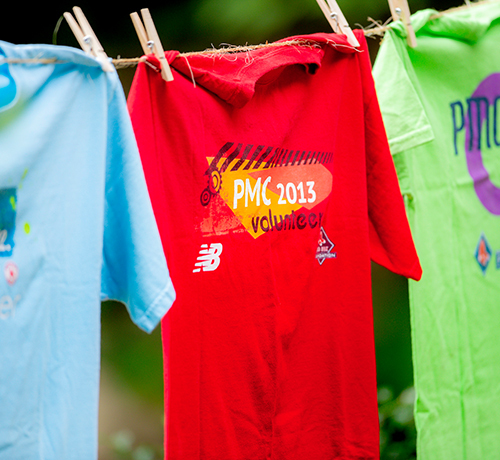 PMC volunteers make a difference – all year round. Check out the calendar for volunteer opportunities. In addition to volunteering, many volunteers choose to fundraise as Virtual Riders. A Virtual Rider is someone who supports the PMC’s mission by fundraising. Virtual Riders have no fundraising commitment and have access to all PMC fundraising tools. As a Virtual Rider, you can ride your own long-distance route, log miles over time, or never get on a bike. The PMC 25/50 is a 25- or 50-mile Sunday route starting at Babson College in Wellesley. As a volunteer, your fundraising commitment is $600 (instead of the standard $1,000) for either of these routes. The PMC relies on volunteers like you to meet our annual fundraising goal. We do our best to provide you with the latest fundraising tools so that you can embark on an easy and successful fundraising campaign. On PMC weekend, carry the handbook with you, access it in the PMC app (available for iOS and Android), or download the PDF. It takes thousands of volunteers to make the PMC possible. PMC 2019 volunteer registration for all sites and shifts opens on March 6 for alumni and March 13 for new volunteers.